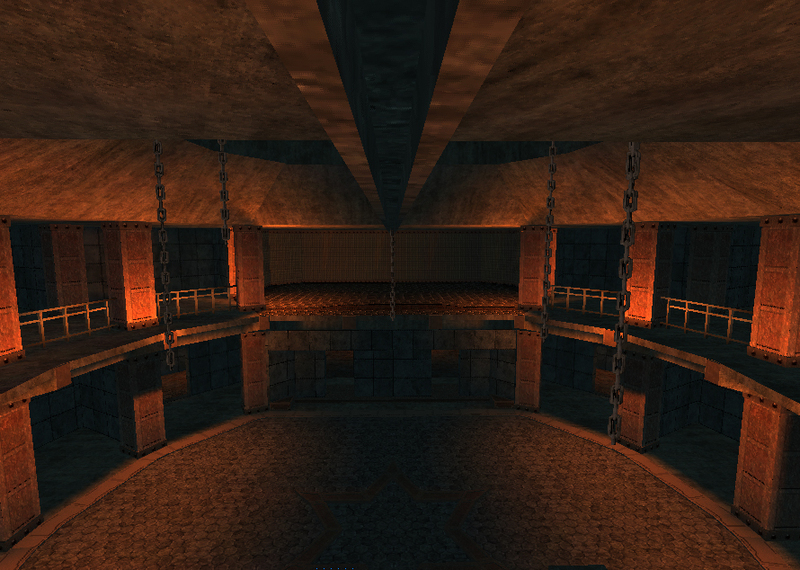 Here is my UT99 map based on Mortal Kombat Deception's Dark Prison stage with working fatality crusher! UPDATE 3z -now has more shower area details/plumbing, water droplets, new torch flames in main center that are closer match to the real game. made lower gates open and close every 30seconds to open the playing field and free moron bots to the slaughter Wink, and a few other minor details like proximity death/gibbed announcer triggers. 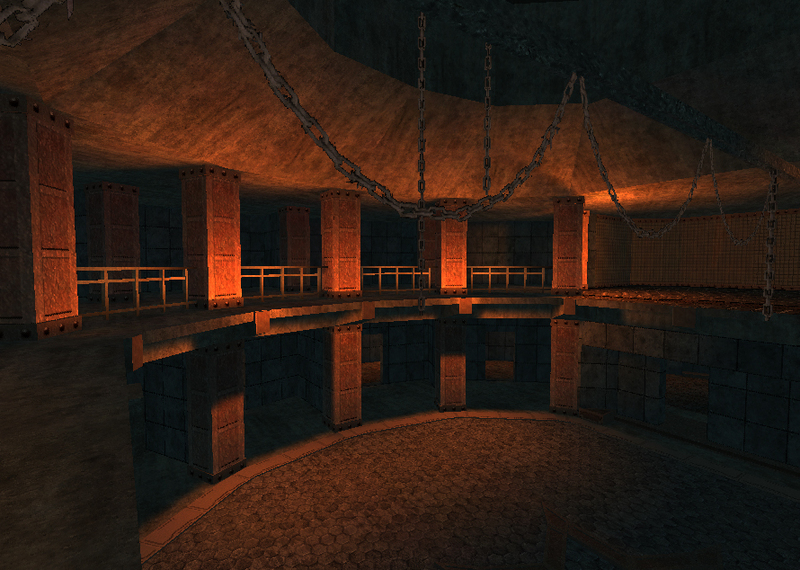 Also updated old lame volumetric 2d vertical fake chains with real 3d meshes. Last edited by bigfoot_pi on Fri Feb 15, 2019 5:31 am, edited 6 times in total. It's pretty, how's the bot pathing? 1 The music doesn't load - the log said "DevMusic: Load music: Music MKD-DarkPrison_musicSB.MKD-DarkPrison_musicSB. Warning: glxLoadMusic(&Mem, GLX_LOADFROMMEMORY ) failed: 15"
2 The trap operates from two triggers and it might be better so that it is just operated by the trigger in the central motif - that way the player operating the trap gets the satisfaction of seeing it work. Whilst the trap is appropriate in this type of map, it's only going to work once for Players whilst the poor Bots will fall for it all the time because of the attractive pickups; so much so, in fact, that they started to end up with minus kill counts. I liked the sound effects of the trap though. 3 Most of the playerstarts seem to be either in the cells on the first floor overlooking the central arena or (fewer) in the arena itself - the consequence of this is that a lot of the bot v bot action I observed took place on the first floor. There were periods of the game when the bots did not emerge from their cells. 4 The bots seldom used the corridor behind the arena and, if they did, could not open the door(s) to get back into the arena. They didn't use the lift and were seldom in the top floor room with access to the lift. 5 Given what I've said in 3 and 4, you may want to have a look at the pathing to try to get the bots to move around more and, possibly, put some player starts in the ground floor cells. 6 It's pretty unlikely that anyone will find the semi-hidden area with the warhead launchers I would have thought, particularly with a large number of players and intense action. The bots certainly never showed any signs of looking for that stuff. yeah. 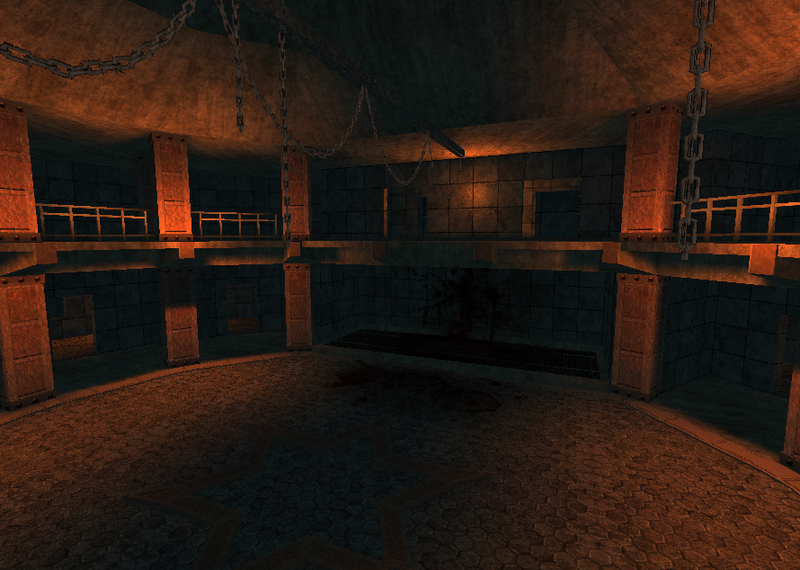 the music is ogg import based on the new "old unreal" and openal audio patches. I will make a classic umx with a modder app for those running vanilla UT. Ill be back later with a new umx music file. thanks again. EvilGrins wrote: It's pretty, how's the bot pathing? Last edited by papercoffee on Sat Jan 26, 2019 9:51 pm, edited 1 time in total. That lift have no paths and there is not jumpy route to upper area. Penta Posting ? See posting rules because admin will get mad. just before I go into what I did, at first I wasn't aware too but on forums in general and this one too you must wait a response to make another comment. See above you did comments in a row, you can alaways edit the first you did and copy what you put in the others and delete them (basically merge all 5 coments into a single one). Also you can edit your original map post name and then put a comment to bump it into the top. You are right the freaking frig kept ocasionally collapsing due some random bps view error. Still I managed to complete half of the 1st level lighting. I didnt do the whole level as this is just a demonstration of my aproach into it. Regarding gameplay I really like the style, and the amtosphere. The bots are stupid AF and your usage of movers to make blockage confuses them. It runs really slow on my potato PC but then again that might be from all the objects used as decoration. Refrain from double posting within a 24 hours time limit. Our member can edit their post.